If Morgan Stanley are so bullish on USD, why do they want to sell it? 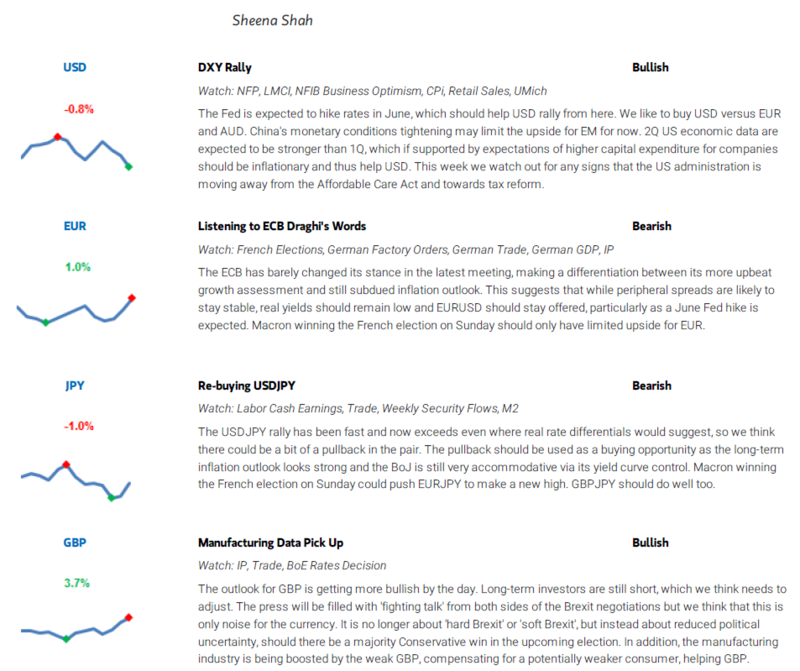 The guys at Morgan Stanley are still running a 111.00 bid in USDJPY, and remain bullish on the US dollar overall, however, they are looking at selling a decent rally in USDCAD. "CAD: wait for the dip to buy. Since last Wednesday, markets have been focused on headlines related to the loss of funding (deposits) from a large Canadian subprime mortgage lender. To us, the story in and of itself is not enough to bring down the Canadian system. The problem in this instance appears to have been fraudulent mortgages driving a run on deposits - ie this was a liability, not an asset, problem. However, the story highlights a vulnerability for Canada, which may limit upside for CAD for now. 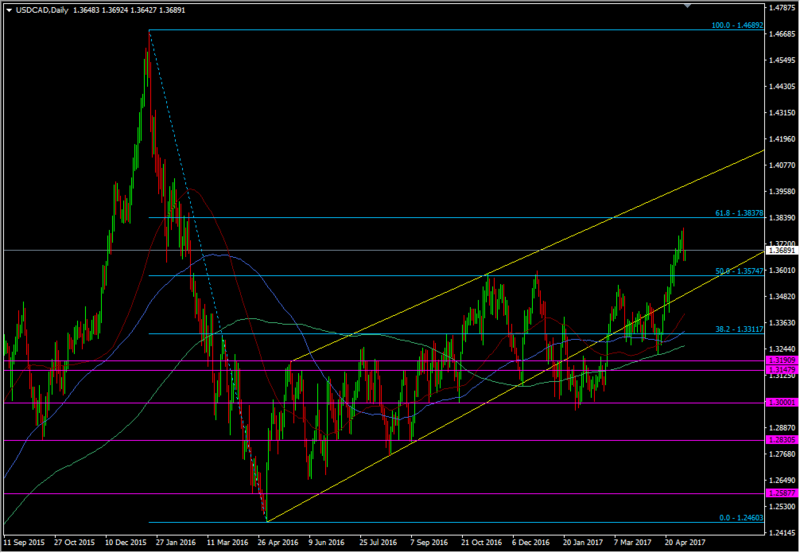 Selling USDCAD around the top end of the channel at 1.40 offers good risk reward." "What's the issue with Canada? The crux of the US-Canada dairy trade dispute lies in ultrafiltered milk, an ingredient used to make cheese and yoghurt. Ultrafiltered milk was not subject to Canada's agricultural import tariff quotas as it was developed only after the current trade agreements were passed. This allowed US ultrafiltered milk exports to Canada to be priced competitively. ...should the US impose trade restrictions on Canadian dairy products, it could weaken CAD initially through the expectations channel as investors may be worried about the US administration imposing more trade barriers on other Canadian exports, potentially posing as a drag to Canada's exports and hence economic growth. However, the currency weakness would only be sustained to the extent that the trade barrier causes an actual slowdown in Canada's growth, prompting the BoC to cut rates. The markets are pricing 28bp of rate hikes for the BoC by end- 2018, so any pricing in of BoC rate cuts would weaken the CAD. However, while about half of Canada's dairy exports go to the US, the dairy industry contributes only about 1% to GDP, so any US trade restrictions limited to Canadian diary exports are unlikely to have a significant impact on growth." For once I can see the logic in their entry point as I've had that channel on my charts for quite a while now. There's quite a few folks looking at a reversal of the recent rally in USDCAD, based on Friday's move. A good rally always needs a refresh now and again so it will be telling whether this is that, or something more sinister. The 1.3570/90 could be an important support point for the pair if we see further downside. in Canada and would look to sell USDCAD on rallies. 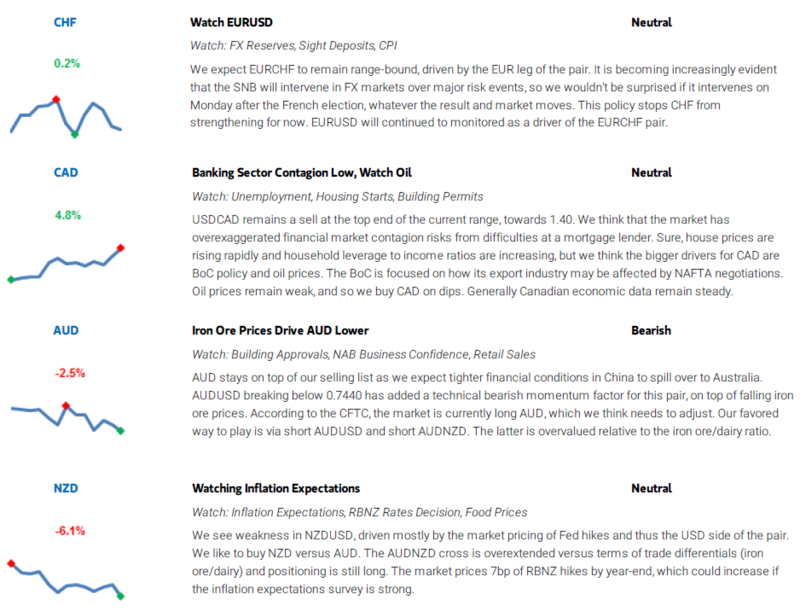 The AUD side is still expressed via short AUDUSD." They have finally got some margin on their AUDUSD short from 0.7540 TP 0.6900 but have moved their stop loss down to 0.7570 from 0.7760. Here's their brief for pairs this week.